Deeksha Surya hails from Bhopal. She could not concentrate on her higher studies due to financial restrains of her family. She was very disappointed because her parents could only afford her study till 12th standard and after that it became difficult for them to meet the educational expenses. She was very confused about her future but wanted to do something for her family. A team of moblizers met her while doing the outreach activity at her place and shared about the free skill training provided by Don Bosco Tech. 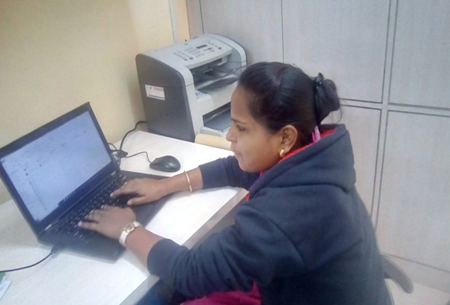 Deeksha came to the centre and enrolled in the Domestic Data Entry Operator course as per her interest. During the training, she was one of the ambitious and regular trainee at the centre. She was always willing to learn new things. The training program helped her to gain new dimension in her life and develop self confidence. Her ambition was to get a good job to support her family. After the training, Don Bosco Tech provides her chance to be interviewed in PIC Certification Pvt. Ltd, where she performed really well in every aspect and got selected with a handsome salary. After gaining some experience from PIC Certification Pvt. Ltd, she switches her company to IPSEITY Group. Now she is motivated and capable to work confidently. Being successful in her career, she is thankful to Don Bosco Tech who changed her life completely in a good way.